A Fine Selection of Local Ale! 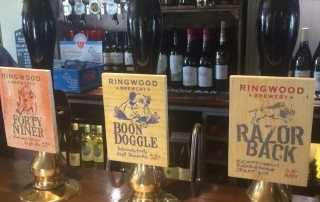 We are proud to home three local Ringwood Brewery Ales here at The Mortimer Arms! Razorback 3.8%, Boondoggle 4% and 49er 4.9%, brewed just a few miles up the road they are all well worth a try! Visit us After The Lost Kingdom! Wow Look At Our Whiskys! We have a wonderful Whisky selection at The Mortimer Arms, the perfect digestif for after dinner, or maybe even an Aperitif! Next Door To Peppa and George! 14 En Suite Rooms in an Ideal Location! We are open for Breakfast everyday!! Serving anything from a simple breakfast bap up to a delicious hearty Full English Breakfast! The Mortimer Arms always has a fabulous selection of homemade desserts on offer so make sure you always save room, served with cream, ice cream or custard!